The NL121 is the easiest and lowest-cost way to add an Ethernet interface connection to your CR1000 or CR3000. This small device, about the size of a deck of cards, simply plugs onto the data logger’s peripheral port. 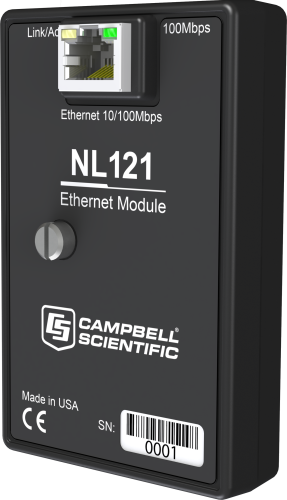 Through the NL121, you can access the Internet capabilities of your data logger, such as PakBus, Modbus, and DNP3 over TCP, as well as web, email, file transfer, and cloud-based application clients. 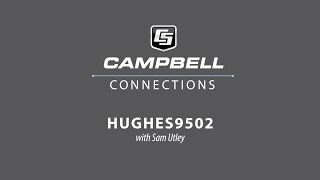 You can collect from and control your data logger over any standard IP network—within your office or across the Internet. The NL121 plugs into the data logger and doesn't require an additional cable to work. The NL121 also doesn't take up much extra space. 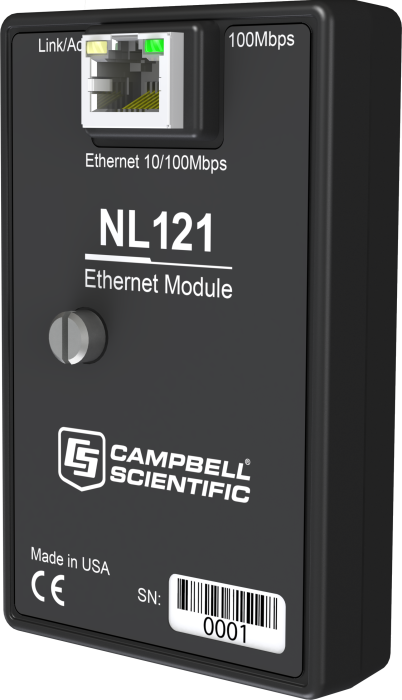 Because the NL121 has a faster interface to the data logger than the NL201 does, the NL121 communicates faster. The NL201 has to be mounted next to the data logger and requires a cable to connect to it. Also, the NL201 requires some additional configuration so that it will work with the data logger. For example, choices have to be made regarding how the NL201 is connected to the data logger.